Ep. 41: Dos a Zero Futbol Podcast – ChivasTV fail, USMNT/Jurgen possession, Messi failure and Copa America. A bloody good time on the Dos A Zero podcast mates. Ragging on ChivasTV streaming failure and high prices was fun. Guadalajara sound clips were in effect. We also had fun discussing Messi and his emotional retirement announcement, right after missing a penalty and losing the Copa America final. Next time he may want to take a few days to clear his mind and think about his decision. Emotional Messi is emotional. Tune in live on Wednesdays at approximately 9pm Central on our Youtube channel and follow us on twitter for podcast announcements. Colombia faced off against the United States for the glorious 3rd place match of the Copa America Centenario on June 25th of 2016 at the University of Phoenix Stadium in Arizona. 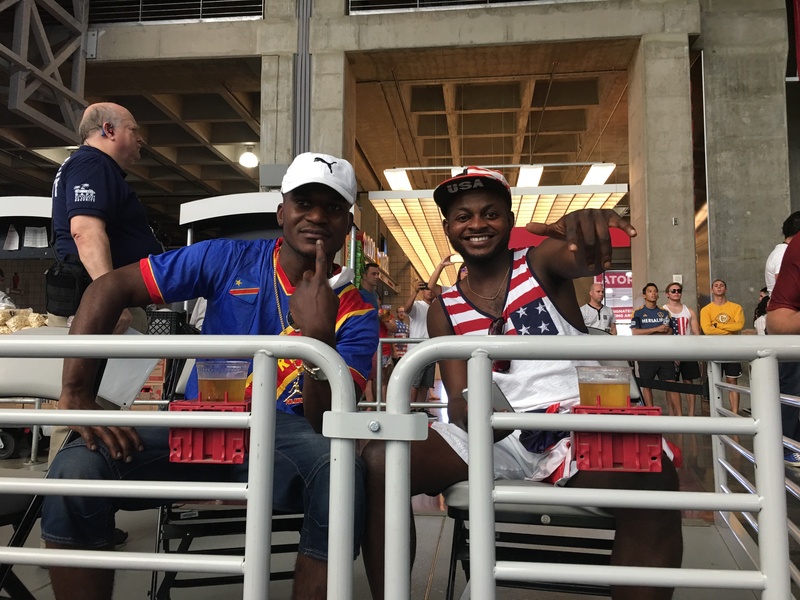 It was a fantastic match, the Colombians brought a great atmosphere and the rivaling USA fans also brought in the noise and jubilation to the West Gate Entertainment District just outside the stadium prior to the match. It was nice and toasty 118 degrees outside but with a little bit of liquid courage, the heat was no longer a factor, nor the fact that this match was for the 3rd place in this Copa Centenario Tournament. Soccer fans came from all varieties, the ever present Mexican fans and even fans of the Democratic Republic of Congo, showed up to see their favorite Real Madrid star James Rodriguez take on the Team USA who was ready to take revenge from the previous group stage match Colombia vs USA, were USA fell 2-0. The coaches took this match seriously and fielded their starting line ups except for Jurgen Klinsmann, who chose to field Tim Howard to guard the American posts. As expected, Team USA ceded possession to the Colombians and played for the counter attack. 51% possession was for the Colombians, and Team USA only managed a meager 3 shots on goal, but it was an improvement from the 0 shots on goal from their previous match vs Argentina. Passing Accuracy for Team USA was at 79% which the lower percentage can be attributed to Zardes first touch on the ball. Colombia managed to break the bunker at the 31st minute, but still kept pressing the Americans into their own side of the field. In the 2nd half, Team USA pushed up their lines and started to take the initiative, taking it to the Colombians, who were playing for the 1-0 result. Things got better when Klinsmann took out Michael Bradley at the 79th minute for Nagbe and the team was able to push the Colombia to their own side of the field and hung on to dear life and that 1-0 result. Eventually things fell apart when Michael Orozco lost his cool and managed to get ejected during a scuffle outside the Colombian’s box. There was no time left, and even after Arias from Colombia got himself ejected from the match, and thus now will miss the first match of the CONMEBOL 2018 world cup qualifiers in September. The 29,041 fans were mostly pro-USA by looking at the video below, where USA fans heckled David Ospina during the entire match. The Puto Chant echoed through out the halls of the entire stadium, but David Ospina later on commented that he understood that USA was the home team, and this heckling was to be expected. The match finished, Colombia 1-0 USA, and Jurgen Klinsmann, the Coach for Team USA made himself available to the media via press conference. In the press conference, he offered signs of hope, and also denied ceding possession to the opposing teams as a strategy for Team USA, despite the fact that all his previous 5 matches, USA did not hold the majority of possession. 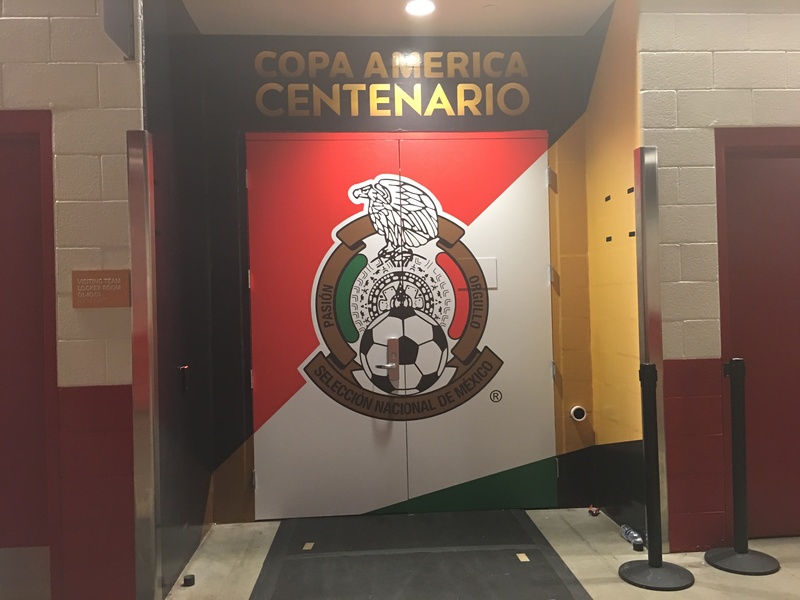 Copa America Centenario is coming to a close, with the second to last match to be played on June 25th of 2016 in University of Phoenix Stadium between Colombia and the United States National Team for the consolation prize of 3rd place. Both teams arrived to this match when they lost their respective semifinal matches, Colombia lost to the reigning Copa America 2015 champions Chile 2-0, and the USA disgraced CONCACAF by being demolished by star studded Argentina 4-0. Jose Pekerman made himself available to the media on June 24th at the University of Phoenix Stadium, in a press conference and answered questions from local media and south american channels. He spoke about taking this match serious and wished that they had made it to the final in New Jersey. 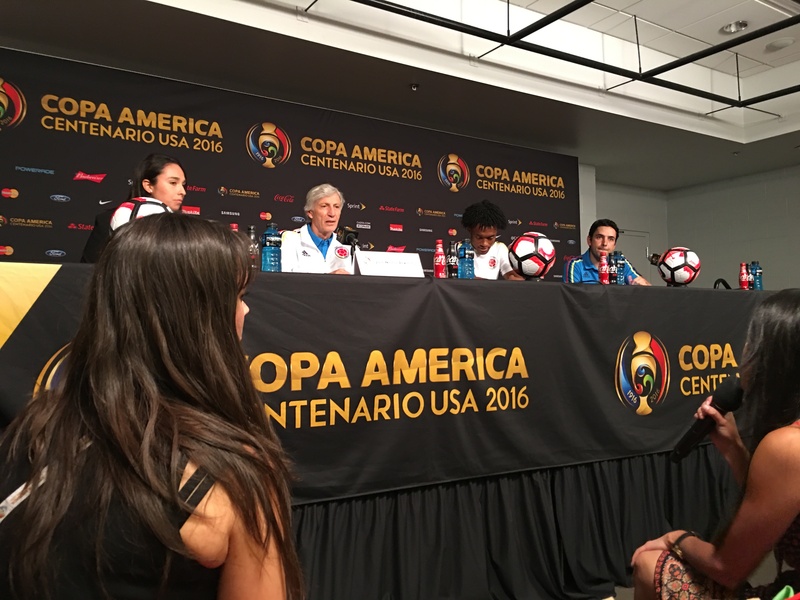 Soccer Chronicle was able to ask a question to Jose Pekerman in regards to the quality brought on by CONCACAF. He spoke well of the US national team and Mexico’s performances in the world cup 2014 in Brasil. He says that certain results can distort the actual quality of the teams since the teams are so equal in quality in this tournament. Interestingly enough, El Profe Pekerman omitted talking about Costa Rica, whom Colombia lost to 2-3 in the last group stage match of Group A as recently as June 11th in 2016. Colombia leads the series versus the USA with 11 wins, 4 ties and 3 losses. Best performance for TEAM USA was in 1995 when they reached 4th place by losing 1-4 vs Colombia. Clint Dempsey reached his 52nd goal for the United States, 5 away from tying Landon Donovan as all-time top scorer for the National Team. Below is a small video of Captain of the Colombian National team James Rodriguez in practice, a day prior to the 3rd place match in University of Phoenix Stadium. Tomorrow, the Tournament will come to a close, when Argentina faces Chile for the Copa America Centenario final. Both teams come firing at full speed ahead. The opposite of “coddling” the Mexican National team. We often hear of parents coddling their kids, or giving kids participation ribbons when they finish in last place in whatever competitive event they are in. In the US, in youth soccer we here about orange slices at half time, caprisuns after the game along with a trip to the ice cream shop as a reward for trying your best. We would never want to criticize little jonny and hurt his little feelings. We also have programs on HBO(trophy kids) about how some parents pressure their kids in sports and then talk about how bad that is. Now lets shift to grown ups. Do we treat grown up men and women like this? Lets forget about a Jurgen Klinsman US team who had zero shots vs the Argentines and not getting flamed, but instead he is seen laughing at the post game press conference. Lets talk about the opposite of coddling, caprisuns and participation ribbons. 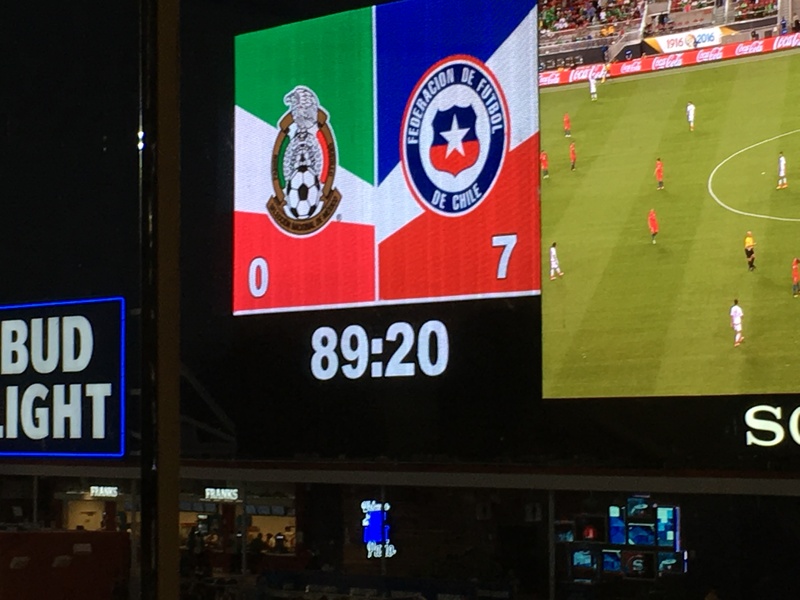 In the Mexico game vs Chile where they put no heart or “ganas” and lost 7-0, the following occurred. The Mexico fans whistled at the Mexican players. They yelled “ole” while Chile was passing and playing “monkey in the middle” with the Mexican players. 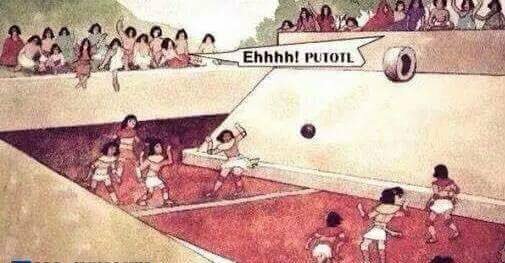 They even yelled “puto” to Memo Ochoa instead of the opposing team. Some would say this is down right rude and classless. That the fanbase should support their team “en las buenas y en las malas”. 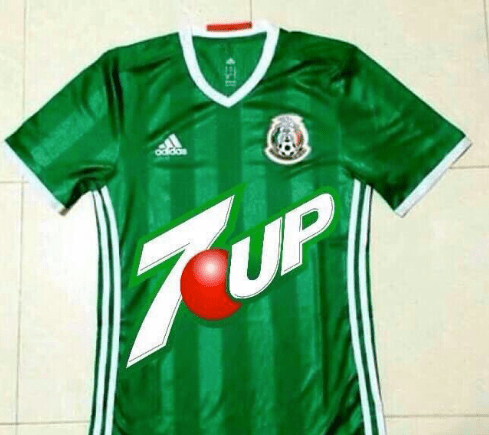 Should the Mexican players get a trip to Pizza Hut for trying their hardest? Wait! They didn’t try their hardest! They disgraced the team. Grown men are grown men, because they can handle criticism and concentrate on the task at hand. They are grown men and should concentrate on fixing their weaknesses despite adversity or the opinions of others. The turning of the Mexican fanbase in the Stadium should motivate the Mexican National team to work harder and ensure nothing like this happens again. It should drive them to work hard and strive to be better. It should provide a motivation for them to shut up the haters. We only hear about weak will/minded individuals go get their feelings hurt then take their ball and go home. This Mexican fanbase should not be berated for turning on the team, or for yelling “ole”, “puto” or whistling. It is just something that happens. Its criticism that should be handled. 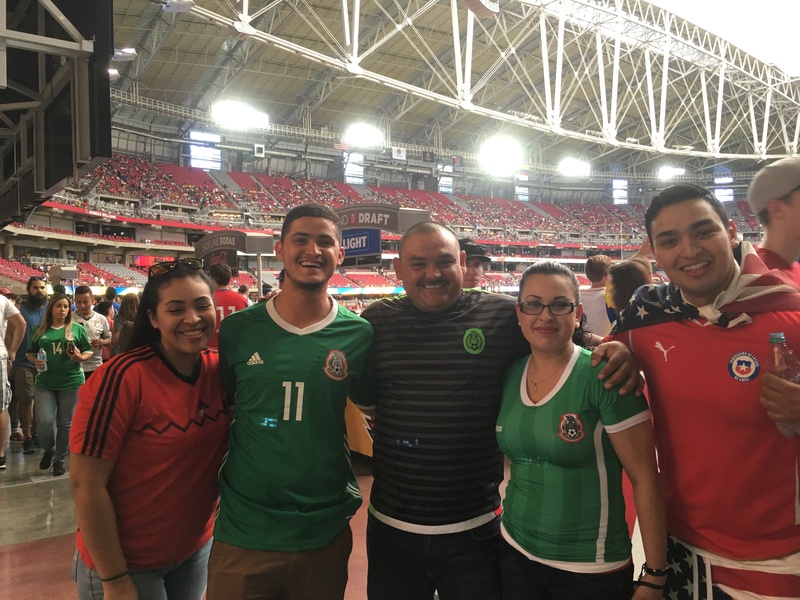 These same fans, will most likely be back paying top price for tickets to see the Mexican team in the US for the next competition, be it friendly or not. These insults are not necessarily an indication of NOT supporting, “in the buenas y malas”. It’s fans that demand more from their team, and hold them accountable. Nothing wrong with that at all. The players and coach have apologized and hopefully are planning improvement and ways to restore confidence and faith in their fanbase. Not for the fans, but for themselves as players to obtain success for Mexican soccer. So when we remind or make fun of Mexico for its failures, it’s all fun and games, but it’s also motivation for things to be improved. We named our show “The Dos a Zero podcast” in jest to have fun in past failures. We had a special “Siete a Zero podcast” after the Chile loss, to cope and have fun even in sadness and failure. So before you write this podcast off as haters or US fans or get defensive, there is context to be understood. Mexico Will take on Chile for the last semifinal berth in Copa America Centenario vs Colombia on a sunny California day here at Levi Stadium in Santa Clara California on 6-18-16. This match up has been sold out since Thursday of this week and as always, that promises a great Mexican presence in the stands. 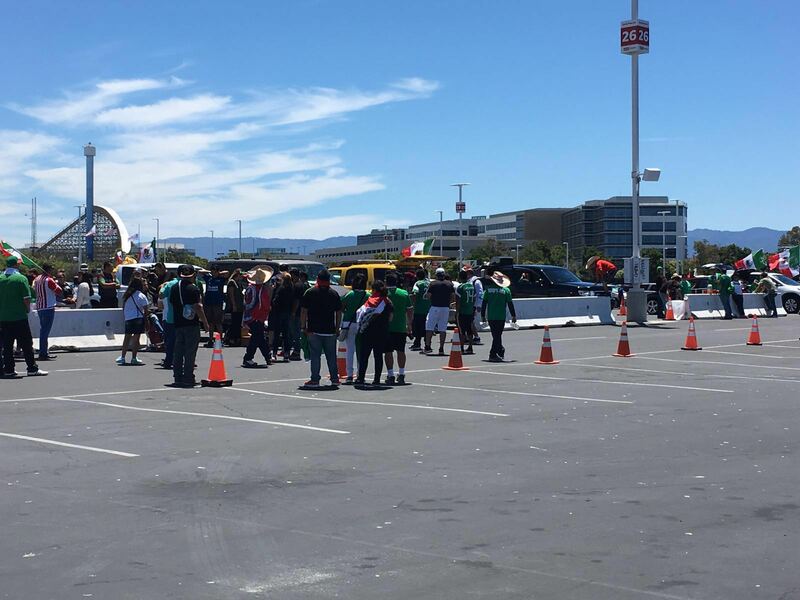 Also, I am being informed that @VillasArmy is already at the venue tailgating in Blue Parking Lot 1. 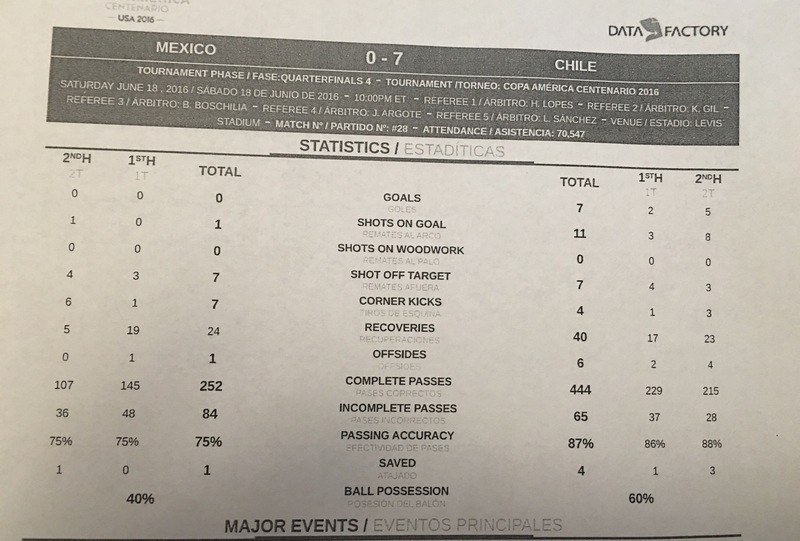 Mexico recently played vs Chile in June 1st as a warmup match before Copa America Centenario in which Mexico came out victorious with a 1-0 result. Mexico dominated the match Alexis Sanchez’s gun powder was still a little wet. Mexico’s defense was leaving room for improvement and that is still a work in progress. Mexico’s overall record vs Chile is 14 wins, 4 ties and 10 losses. In Copa America match ups, Mexico leads with 4 wins, 2 ties and 1 loss. Last Copa America 2015, Mexico tied Chile 3-3, while Mexico fielded an alternate line up and Chile played at home. Chile played at the Levi stadium vs Argentina, and lost 1-2. 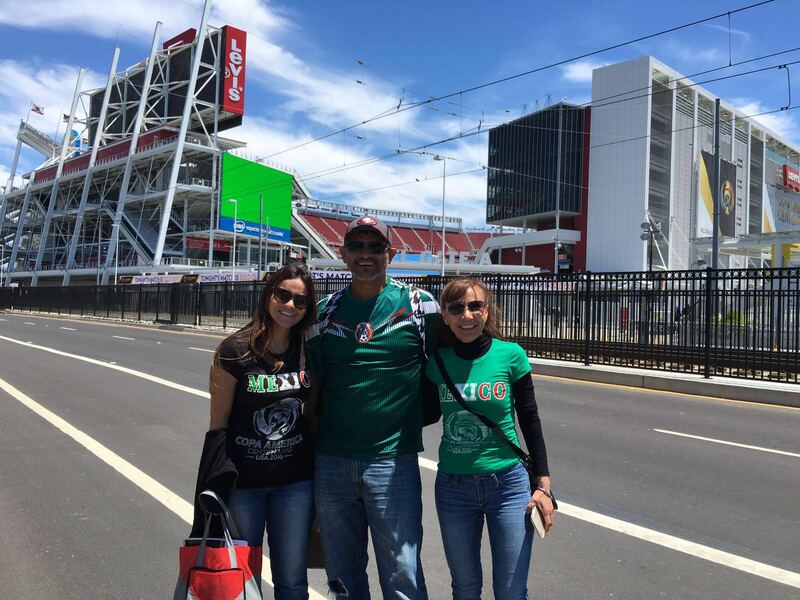 Mexico has the chance to turn the Levi Stadium as a venue for all Chileans to forget forever. Ep. 38: Dos a Zero Futbol Podcast – Mexico avoids Argentina! Vamos al Angel! Short on protagonistas, but we podcasted anyways. Talking how Mexico performed vs Venezuela, opinions on Juan Carlos Osorio’s coaching and lineups/rotations, as well as the future for Mexico in this tournament. Mexico has a huge challenge in Chile and this will be the biggest game for JCO as head coach. I feel Chile will not want to lose to a CONCACAF team and will come out fighting. Now on the topic of avoiding Argentina, yes it’s news, but nothing to overstate. Everyone wants to beat the best, and I would love for Mexico to face Argentina. I just would love for that epic matchup to be in the Final. Selfishly, I am not ready to see Mexico play Arg in quarters and potentially see them bow out slightly early. Argentina is a special type of opponent. One who has eliminated Mexico in a couple of World Cups. It is time for revenge and Copa America Centenario a big stage in which to do it. The Tamborazo could be heard as you drive up to the historic Rose bowl in Pasadena, on a sunny typical California day. When you park, you will be greeted by the sea of green, and I am not talking about the gorgeous grass on the golf course that serves as a parking lot for the Rose bowl, but the 83 thousand fans that packed the venue for the upcoming Copa America Centenario group C match, Mexico vs Jamaica. 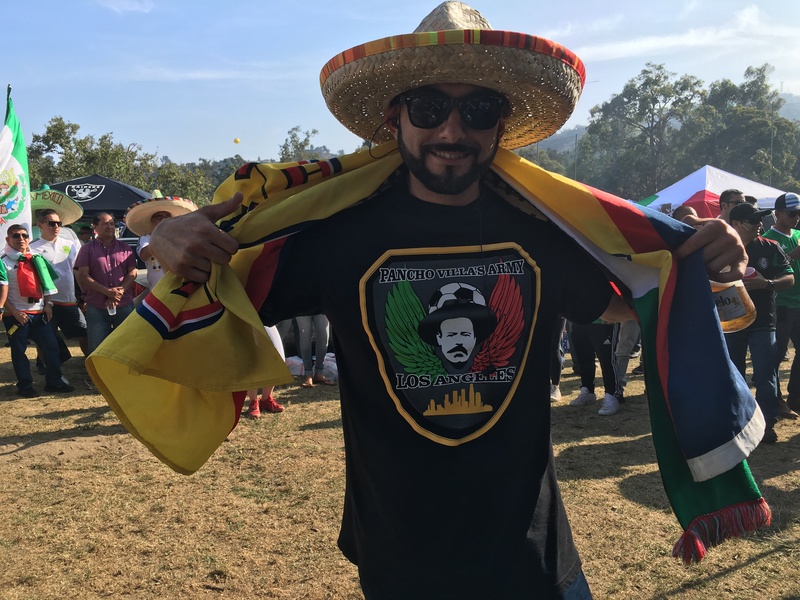 Now enter the Pancho Villa’s Army Los Angeles Chapter contingent @PVALosAngeles into this mix and you get one of the best Futbol atmospheres in this Copa America Centenario, that had everything, Mexican food, Tequila, and just unbridled jubilation from all the Mexico fans. The tequila and other assortment of spirits starts flowing, combined with some fantastic live Tamborazo + beautiful señoritas, Pancho Villa’s Army delivered a great tailgating spectacle of epic proportions. The party was so good, that Photojournalist @afroxander , could not fight off the temptation of such good offerings and forbidden fruits by the LA contingent Pancho Villa’s Army. These Pancho Villa soldados were just getting ready for war in the stands, in one of the greatest arena’s known as Azteca del Norte, formerly known as the Rose Bowl in Pasadena California. Then the message got a political overtone, not that I blame them. Pancho Villa’s Army was ready with the Tamborazo in the stadium, and unleashed a large TIFU, that went without incident, like it happened in Glendale Arizona vs Uruguay. The 12th player, has entered the arena, ready for battle. Mexico entered the Copa America Centenario Group C match with the news that Uruguay had been eliminated by Venezuela in the previous Group C match up. 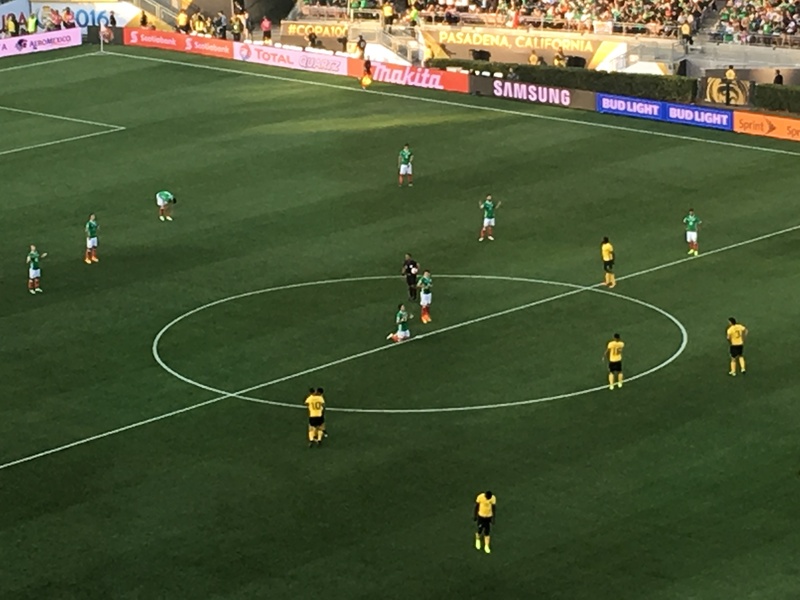 Jamaica cognizant that today, they had to win today in Mexico vs Jamaica at the Rose bowl in Pasadena, in order to have any chance to qualify to the quarterfinals. This proved to brew the perfect storm for an exciting back and forth match up that had rapid changing high’s and low’s during the entire match before a sold out Rose bowl in Pasadena. Mexico started with the same line up from its previous match vs Uruguay, except Jesus Dueñas was in for the suspended Guardado, and Juan Carlos Osorio opted to field Yasser Corona for Diego Reyes and Raul Jimenez for Javier Aquino. Chicharito +10 + the 12th Player were ready to take on the Jamaican team and qualify for the quarterfinals of Copa American Centenario. Mexico kicked off a match that will be remembered for the player rotation and at times a shaky defense. Mexico will score thanks to Chicharito scoring his 45th goal for the Mexican national team at the 18th Minute with a fantastic Header. Mexico stayed on the attack and kept pushing up with their 4-3-3 formation to the Jamaican goal guarded by the Andre Blake. Mexico maintained possession but was hampered by occasional turnovers by the defense. This emboldened Jamaica to play for the counterattack. 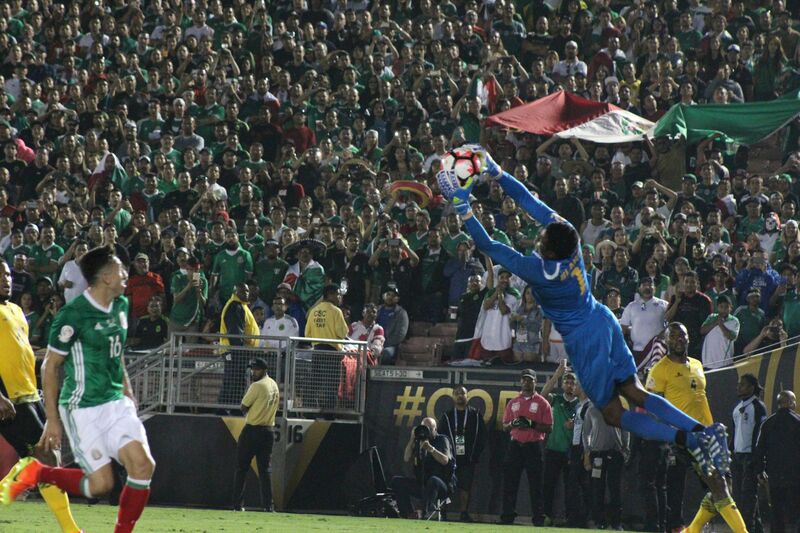 That is when Yasser Corona stepped up and became the hero of the night, by saving the Mexican goal, and a combination of Ochoa’s trademark spectacular performances. In the second half, Juan Carlos Osorio decided to change some inequities in the field and substituted Tecatito Corona for el Chuky Lozano. The key change that gave more balance in the midfield to Mexico, happened when Jesus Dueñas came off to give way for Jesus Molina. Eventually Chicharito came off and El Hermoso Peralta came on, which was a masterful key move by Juan Carlos Osorio, since Peralta scored and sealed the result for Mexico in the 81st minute. At that moment, it was checkmate. Jamaica says good bye to the Copa America Centenario with one match left to play. Regardless of all the nitpicking on the defense that kept Jamaica with a clean score sheet, the 83,263 fans were treated to a fantastic night of back and forth Futbol, that will linger in their collective memories till the end of their times. Nestor Araujo gave us a small brief rundown on how the defense performed vs Jamaica, and he was kind enough to to answer a few questions about the match in the mix zone. Ep. 37: Dos a Zero Futbol Podcast – Copa America is underway! Copa America is what we are about right now. Mexico beat Uruguay in its first match and we talk about how salty Uruguay is, as well as Mexico tactics, drama and Rafa maybe not being such an old man. Rafa is being played in a position where they are protecting him and he seems to be doing well. The goal especially helped his cause. We also discuss the tournament as a whole and some of the blunders made. Also the rumors that the Gold Cup and Copa America could be combined. South Americans do not like this idea, but the money is what could sway the interest. Complaints that the tourney is catered to Mexico or that Copa America is a CONMEBOL tournament and not CONCACAF could just disappear with the right amount of zeros on a check. One last topic we covered was the mentality of South American teams having an attitude of superiority against Mexico and CONCACAF teams. So when they lose to Mexico it’s extra painful and hard to accept. This is similar to how Mexico feels when they lose to the USMNT seeing that soccer is not the main sport in the US. Interesting thought that we touch on.